What is Microsoft SkyDrive and How Can You Take Advantage of it? You are here: Home / Blog / Device Sync / What is Microsoft SkyDrive and How Can You Take Advantage of it? As you know, today’s user is flooded with information that’s important to them and many use different cloud services to store their data. Of course, when they’ve stored several documents in the cloud it’s often difficult to remember how to find a document when they need it. This is where LifeTopix comes in — allowing users to locate their documents in context of their projects, parties and other events, trips, and more — bringing everything together into one pocket-sized organization miracle. We often talk about the popular cloud services that our customers use to manage their documents, photos, and other media. 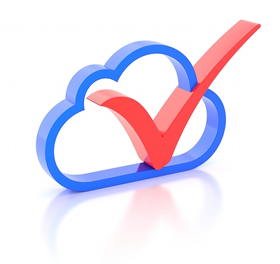 And our users clearly recognize the value of storing and managing their documents in the cloud. Because there are so many excellent cloud services, we’ve chosen to integrate with the best of the best — Google Drive/Docs, Evernote, and Dropbox. We continue to support more and more of these services for device-to-device sync, file access, and backup and restore. And now, we’re very excited to announce our latest addition — Microsoft SkyDrive. This post is intended to give you a brief introduction of SkyDrive, and how we support it in LifeTopix. Similar to Google Drive/Docs and Dropbox, SkyDrive enables users to store their files in the cloud and access them from their mobile devices or personal computers. And like Google Drive/Docs, users can share word processing documents, spreadsheets, and presentations for the purposes of concurrent collaboration. Editing and collaborating is available through the free online version of Microsoft Office products — including Word, Excel, and PowerPoint. SkyDrive also includes the ability to create and share OneNote notebooks and Excel surveys, as well as to modify files created with the desktop version of MS Office. SkyDrive is a free download with 7GB of free storage for starters and upgrade options are available. 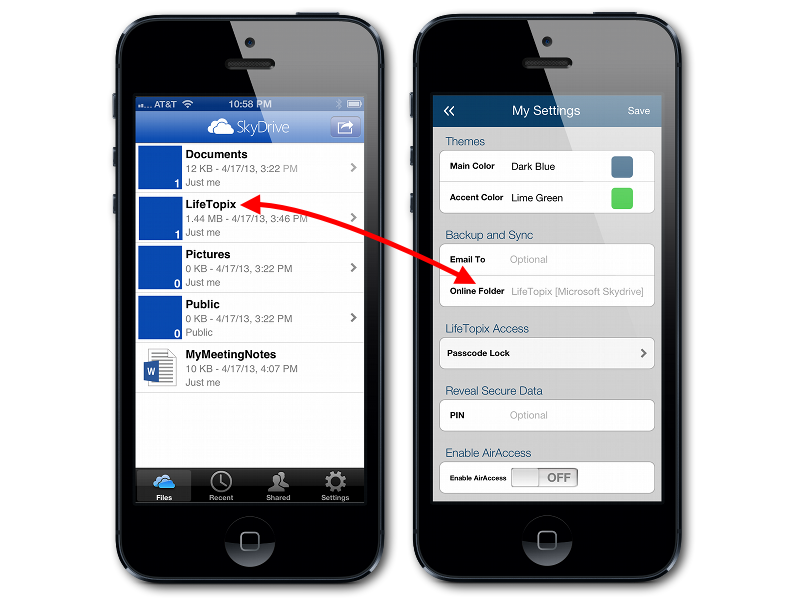 The mobile app for file access is free and available for Windows Phone, Android, iPhone, and iPad. To get started with SkyDrive, go to http://windows.microsoft.com/en-us/skydrive/download and follow the directions. How Does LifeTopix and SkyDrive Work Together? SkyDrive makes it easy to store and share Microsoft Office files created from the desktop app or from the web interface. We have chosen not to replicate this functionality, but rather to allow our users to attach, view, download, and upload files from SkyDrive to LifeTopix. For example, you might choose to attach spreadsheets, OneNote notes, and other documents to a “Paperless Office” project within LifeTopix. The following screenshot shows how LifeTopix can be used to attach files to a project. After adding your SkyDrive folder to LifeTopix via Notes + Files, the files become available for viewing in context of the project. We’re very excited that we’ve added device-to-device sync via SkyDrive to our list of cloud services that we support. Still, the most reliable choice for device-to-device sync for LifeTopix is through Dropbox. If it’s imperative that your multiple devices are in sync at all times, we suggest that you use Dropbox. However, we’re continuing to refine the implementation of our device-to-device sync through iCloud, Google Drive, and SkyDrive and expect all services to be equally reliable. If you would like to set up device-to-device sync through SkyDrive, the process is the same as Dropbox and you can watch the following video to learn how to set it up. Make sure that you choose Microsoft SkyDrive as the service that you wish to use for syncing, and one caveat I suggest is that you set up a folder in SkyDrive for your sync files prior to configuring your device-to-device sync. In the following example, I’ve set up a folder in SkyDrive and named it LifeTopix, then I referred to it in the My Settings view of the LifeTopix app. We recommend that you back up your LifeTopix data on a regular basis to ensure your data is not lost in case of a technical issue or if a device problem occurs. With the addition of SkyDrive integration, it is now possible to back up your data to SkyDrive. Simply set up your Online Folder as shown in the screenshot above. 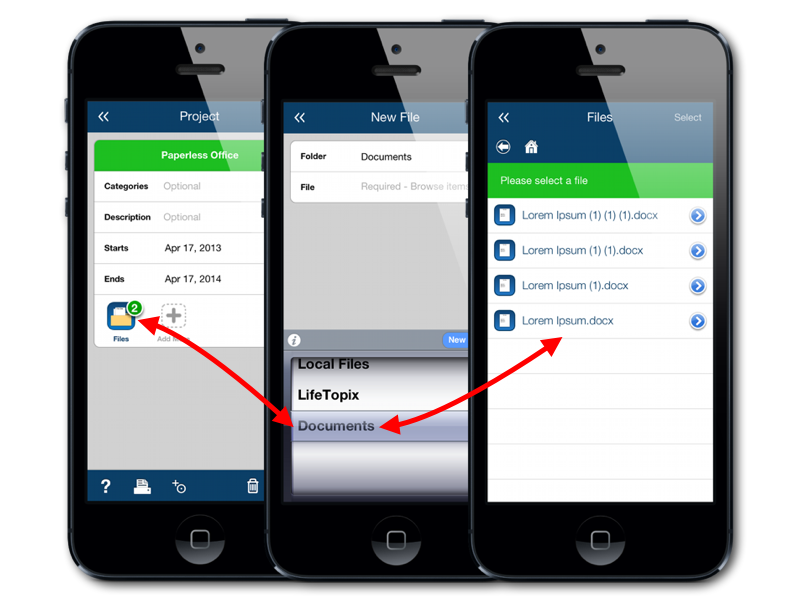 LifeTopix uses the same folder you designate for device-to-device sync for backups and restoring your data. We hope that you’re as excited as us to have more choices for device-to-device sync, file access, and online backup and restore. Please let us know if you have any questions or comments. We welcome your feedback. http://lightarrow.com/wpcms/wp-content/uploads/2013/04/cloud-1.png 209 222 Marilyn Rogers http://lightarrow.com/mktgimages/lightArrowLogo.png Marilyn Rogers2013-04-18 13:18:122014-07-16 17:15:47What is Microsoft SkyDrive and How Can You Take Advantage of it? how many data we stor in skydrive? The amount of data LifeTopix stores on Skydrive will depend on the amount of data you have created in LifeTopix. This includes both data stored in the LifeTopix database as well as any files (included photos and videos) that you have added to LifeTopix. The amount of data skydrive allows will depend on you skydrive account.